It’s Halloween when an ugly stuffed witch tells Pumpkin that all pumpkins end up squashed on this night. Pumpkin dashes off for safety. Can he save himself, or does he end up an orange blob on the side of the road? Pumpkin Pie’s first day at a new school, unknowingly, coincides with the class Halloween party. 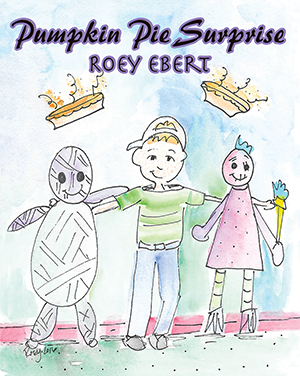 Follow first grader Pumpkin Pie on a day filled with surprises and his case of first day jitters! 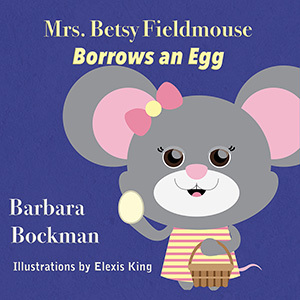 A charming tale that teaches children the joy of friendship and helping others. An unexpected chain of events leads to a clever ending and a birthday celebration enjoyed by all. Come along on a madcap adventure where traditional punctuation and meter take holiday and hilarity rules the day. 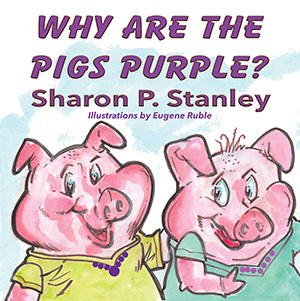 Similar in style to the much loved “If You Give a Moose a Muffin,” readers will love this rollicking tale of pigs gone wild, which will leave you breathless but wanting more! Marcel Marcelli’s days were filled with fun and laughter till the day Grandmama’s antique cupboard was moved into his home. Then fear grabbed him and didn’t let go. When all his attempts to master the fear failed and nobody could help him, his guardian angels had a heavenly idea! 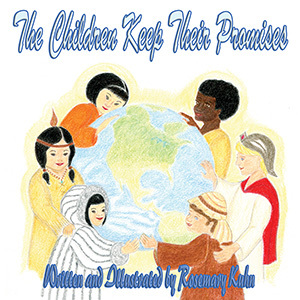 The Real Star of Bethlehem is a children’s Christmas musical that teaches this kingdom principle—the way up is down. 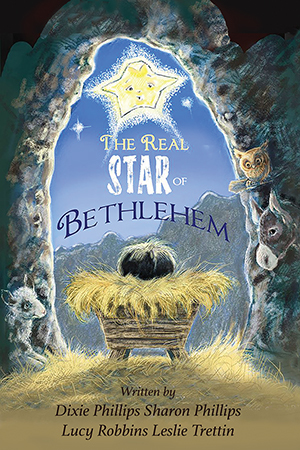 As the “stars” compete for the spotlight, they experience many “enlightening moments.” Their perspective changes when they begin to understand the humility of the real “Star” in Bethlehem—Jesus! Travel around the world to meet six uniquely gifted young people. Each is working to promote a peaceful environment because of a promise they made to angels on the night that Jesus was born. 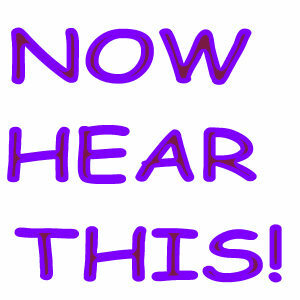 Young readers are also invited to join in sharing the Good News of Jesus. For these and more books from Guardian Angel Publishing, visit http://guardianangelpublishing.com. As you have probably noticed, I haven’t been blogging as much as I used to. Seems I must be a good real estate agent, because I have been very busy and some have told me it’s unusual for a newbie to have such a successful first year. Yay me! So, after careful consideration, I decided to put my writer’s blog–Little Shepherd–on hiatus for a while. The good news is that the updates I used to make there–announcements of when I blog at Christian Children’s Authors, goal updates, writing news, and the sharing of youth ministry resources–will appear here at The Children’s and Teens’ Book Connection. Hope you all have a great weekend. Thanks for your readership. Book Description: Feeling mindful is feeling good! You know when you’re having a bad day, you have that wobbly feeling inside and nothing seems to go right? Find a quiet place, sit down, and meditate! In this daily companion, kids of any age will learn simple exercises to help manage stress and emotions, find focus, and face challenges. They’ll discover how to feel safe when scared, relax when anxious, spread kindness, and calm anger when frustrated. 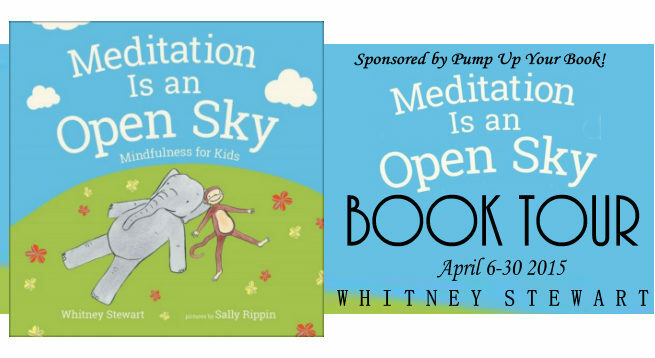 Simple, secular, and mainstream, this mindfulness book is an excellent tool for helping kids deal with the stresses of everyday life. Wow, this is a wonderful book for kids to introduce them to the art–and habit–of meditation. So many skills are taught in school…yet I wish this important one could be taught as well. The author has done an amazing job at explaining not only what meditation is, but also provided instructions on how to meditate depending on the child’s various moods–all in simple, straightforward language. The illustrations match the content beautifully, with soft pastel colors that are calming to the mind. I can’t say enough good things about this important book. If you’re a parent or a grandparent, I urge you to buy it for your little ones. If you’re a teacher, this would be a wonderful book to have a class meditation as a group. Highly recommended! Alinka Rutkowska is a “Reader’s Favorite” Five Star Picture Book Author. She writes the “Maya & Filippo” Book Series for Children – travel books for kids with a positive attitude. She takes inspiration from her own travels while cruising with her husband and daughter around the world. She is positive, appreciative and happy 95% of the time and during the miserable 5% she thinks to herself quickly: “things always work out for me” and they do. Alinka’s doesn’t really have a “to do” list but she does have a “fun things to do” list. It usually consists of writing, reading, reading her writing, writing in her diary, blogging, reading other blogs, commenting, breathing deeply, meditating, feeling the warmth of the sun on her skin, closing her eyes, breathing some more and thinking what a wonderful world she lives in. Sometimes she takes a few minutes to pause and instead of doing something from her “fun things to do” list she just daydreams a little. She thinks of all the great things that she wants for her to happen and imagines how wonderful it will feel to be interviewed about them in the future. She’s already preparing the answers to those interview questions in her mind. She especially loves the part, in which she says that she achieved all these things because she spent a considerable amount of time visualizing them first. Alinka loves to ski while listening to music at the same time, she enjoys an occasional glass (or bottle) of Barolo with dark chocolate, she loves cuddling with her husband and daughter. Alinka really likes tea, especially that last sip which is usually the tastiest. Alinka blogs daily at www.mayafilippo.com for parents, travelers and authors. 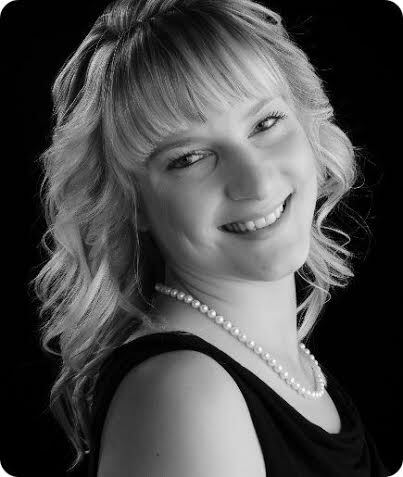 She loves to connect with like-minded individuals on Facebook (https://www.facebook.com/mayafilippo), Twitter (https://twitter.com/AlinkaRutkowska) and Linked-In (http://www.linkedin.com/in/alinkarutkowska). In primary school. As a school girl I used to carry a notebook and I would fill it with poems of my own production, whenever I felt inspired. I think I might still have it somewhere:) I was also founder and editor of the school newspaper. I loved writing and publishing since I remember. I wrote my first published work in 2010 and it was an incredible success! I still haven’t quite figured out how that happened but I sold thousands of copies in the first months after launch. That was the moment that I decided I had to quit my corporate job and think what I really wanted to do in life. After a few years of searching what my life’s purpose truly is, the Maya & Filippo picture book series were created. It’s now a brand and I am very excited about it. I’m a mom and a writer. In that order. This means that I can write when my daughter is asleep. I always make sure that I’m undisturbed, centered, relaxed and that I have a clear mind. I usually spend several days (or weeks!) letting the idea for the book marinate in my head and when the right moment presents itself, I pour it all on paper (or screen!). A picture book is only about 1000 words long and it takes me about an hour to write it. It’s a very intense hour – I usually type like crazy with only brief pauses to read what I wrote. That’s how the first draft is born. 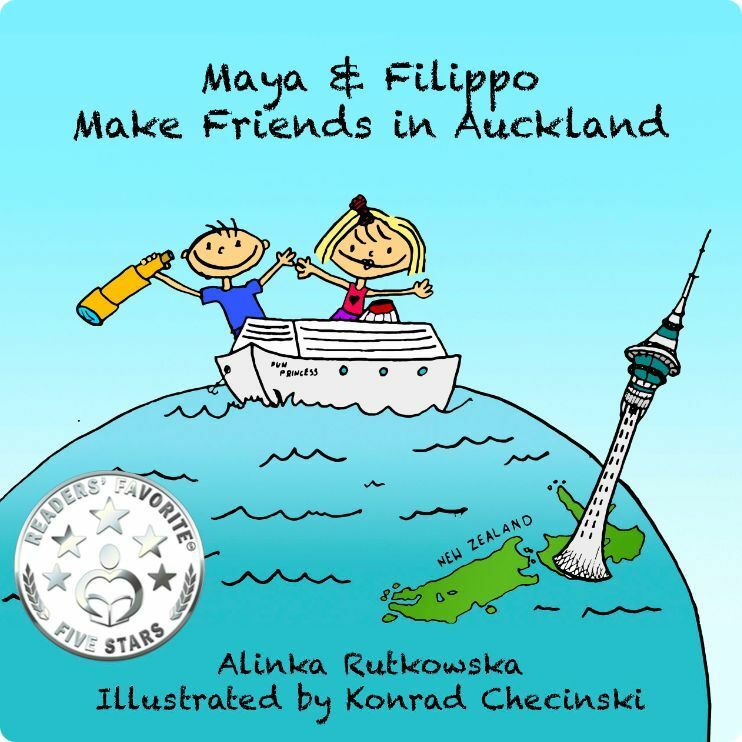 Maya & Filippo Make Friends in Auckland is the first of the Maya & Filippo series and it’s about two children discovering the world on a cruise ship. They explore both the sights and the world inside their minds. They dock in Auckland (New Zealand) and have a rough morning, they then go to see the city and notice a very strange thing – the more positive they are, the better their day becomes. They soon take advantage of this new law and make sure that some amazing things happen before the sun sets. Back in 2011 I stepped out of my comfort zone, quit my corporate job and took off for the other side of the world – New Zealand. I was all by myself and I soon noticed that the better my attitude was, the better my experiences. I took advantage of this knowledge. I went on a cruise expecting the best and it did turn out to be the best decision of my life. I met my now husband on board and now we cruise together around the world. This gives me plenty inspiration for new Maya & Filippo adventures. I had already published several books in the past so this was smooth sailing. The challenge was to find a reliable team. It took me a while to find passionate people to work with. It’s important to me that they care for these books, for the characters and the philosophy they convey. Luckily, after a few months of searching everything is in place now. 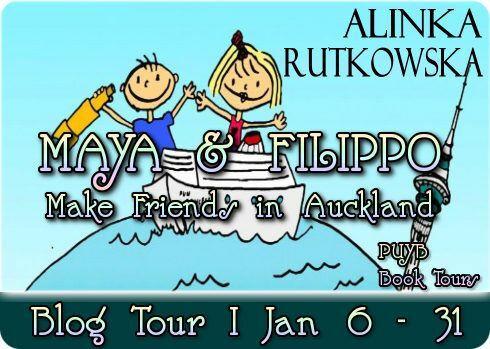 Maya & Filippo Make Friends in Auckland is available on Amazon (http://amzn.to/IszTxo) and in any major book store. I’m also very active in promoting this book to libraries, book stores and tourist centers in Auckland and I will soon be able to announce that you can get it there. There’s one more thing and this one is huge – it might still be confidential and I’m not sure if I can tell, but one of the big cruise lines will be carrying my titles in their on board boutiques. That for me is a dream come true! The best investment was a review copy I gave as a gift to a Vice President of one of the biggest cruise companies. She wrote back to me saying that she LOVED the book and wanted to sell copies on board. Sometimes a small gift goes a long way! The truth is that I give out plenty of review copies – to anyone who would write a review in exchange. I send my books out to people who have a large following and can make an impact on sales. I also like giving my books to friends who have children. I give, give, give! And then every now and then – I get back big time. Writing, publishing and promoting. I love what I do and I want to do more of it. I will be writing more Maya & Filippo episodes. I’ve already written these and the artwork for the covers is also complete, so they will all have been published by mid 2015. I am now going to Hawaii and I will definitely not come back empty-handed. I think I will also include a few European ports in my future books. We are talking about 2015-2016 here. 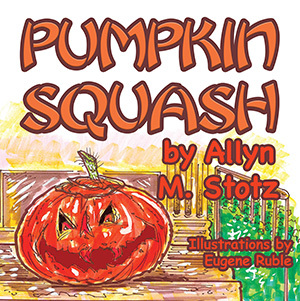 Each book requires copy-editing, illustrations, coloring and graphic design. I have a team of people with whom I work closely to get each book ready for publication. After that I spend my free hours spreading the word out. I want this series to get to people who will appreciate it and that’s a full time job! Although born in New York City, Sal was a restless baby. After only a week he moved to New Jersey and stayed there right up until he got married. Then he and his wife Sheri, his artistic and business partner, moved cross country to Arizona. Sal lives the phrase: “A day without laughter is a wasted day.” To that end, he uses his writing, illustrating and animation skills to create endearing characters and comedic stories. As the creative director for Hartman-Barbera LLC, Sal paints, sculpts, draws, animates and writes. When he’s not working, Sal enjoys cooking, watching TV, going to movies and playing golf. 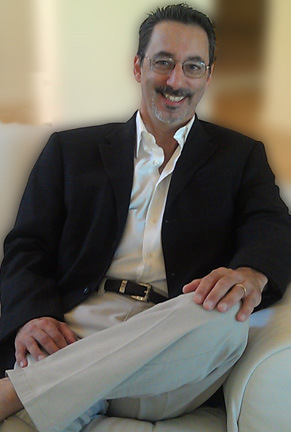 Sal is a member of the SCBWI, The Society of Children’s Book Writers and Illustrators. Thank you for joining us today, Sal. Can you please start off by telling us a bit about yourself? I loved growing up in New Jersey. There was New York City on the other side of the tunnel, or the beach just a short drive away. I was at the jersey shore a lot, but that was a while back when everybody had regular names. No Snookies or Situations to speak of. I started writing stories with illustrations about our little dog Max over 15 years ago. He is the inspiration for the character Sweetles, which is one of the names we called him. He is also the muse for the series of books I’m writing now; A Sweetles Dream ®. My wife and I wondered what he dreamt about when he was running and whooping in his dreams. So I took the liberty of using my imagination to imagine his. And that’s the premise for the book series: a little dog that sees a personal or social situation during the day and dreams up the solution at night while he’s sleeping. I’ve always done lots of wacky drawings with captions. It was easy to make the transition to books and fun to put my drawings with the stories. Although I never actually decided to write children’s books, my stories seem to be the perfect length and style for picture books. Not really. Writing for a young audience is fun. Especially if you inject some humor for adults throughout the tale. It makes it fun for the adults to read the stories along with the kids. The questions you don’t see coming. Kids are hilarious and come up with some very funny remarks. I’ve learned a lot about why I write answering their questions. Another favorite part of writing is when I hear or see a positive response to one of my books. That’s very rewarding. I was recently at the Orange County Children’s Book Festival and two little girls and their Mom picked up my book. The older daughter read it from cover to cover. As she was reading, her smile got bigger and bigger. At the end, she asked her Mom if she could have the book. It actually made my eyes misty. It’s great when a complete stranger wants to own my books. 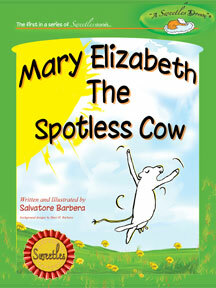 Mary Elizabeth The Spotless Cow is about a “spotless”cow that arrives at a new farm hoping to find friendship. Instead, because she’s different from all of the other cows, they don’t want anything to do with her. She must find a way to overcome their “Spot discrimination.” The story is about how she accomplishes this in her clever, diplomatic and funny way. My mother-in-law is one of my best friends. Awhile back she was going through a rough time with breast cancer, chemotherapy and radiation. She needed cheering up. So I decided to write a funny story to lift her spirits and make her laugh. That story became the tale of Mary Elizabeth The Spotless Cow. 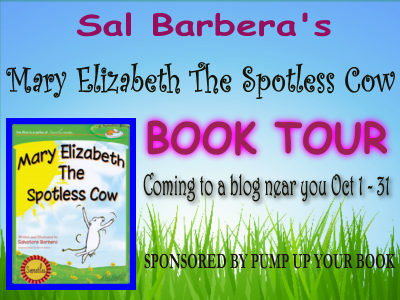 During the month of October, Mary Elizabeth The Spotless Cow is a special price of $12.00 for your readers (list $17.99) on the publisher’s website: Sweetles.com It’s always available on Amazon. 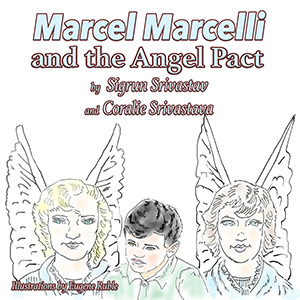 I’ve written and illustrated the second book in the A Sweetles Dream® series. It’s called: Ernie The Dysfunctional Frog. I’m also working on a web series for kids with the Sweetles™ character along with his fairy tale friends. It’s a mixed media web series that will be educational and wacky too. The tagline is: “Have fun learn and play, that’s a Sweetles Day!” Think: Sesame Street meets Monty Python and that will give you an idea of what’s coming. Check the Sweetles.com website for updates, or go to SweetlesTV on youtube. If you’re not afraid to use your imagination, you’ll be surprised at the wonderful things you can come up with. And try to laugh every day. It’s good for your health. Thank you for spending time with us today, Sal. We wish you much success. Thanks for the opportunity to share my thoughts with you.